WHEATFIELD — As it turns out, the Yellow Brick Road may wind its way into Wheatfield after all. 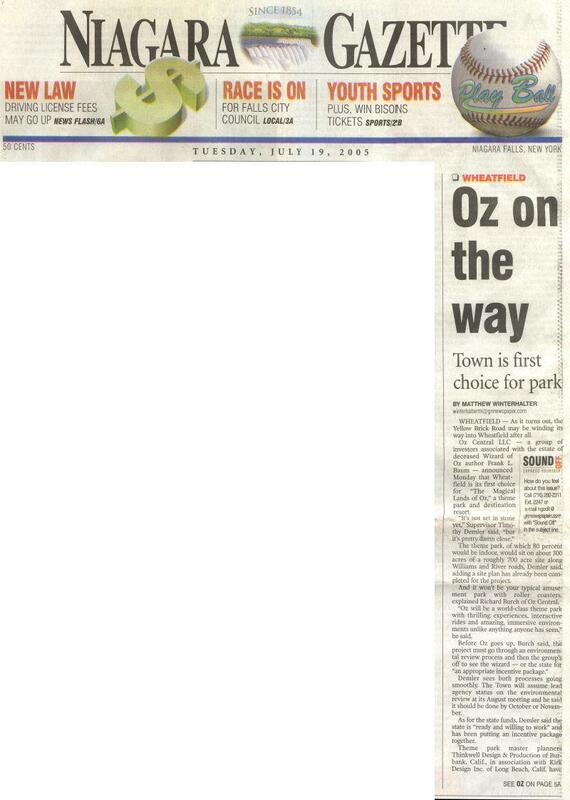 Oz Central LLC — a group of investors associated with the estate of deceased Wizard of Oz author Frank L. Baum — announced Monday that Wheatfield is its first choice for “The Magical Lands of Oz,” a theme park and destination resort. The theme park, of which 80 percent would be indoor, would sit on about 300 acres of a roughly 700 acre site along Williams and River roads, Demler said, adding a site plan has already been completed for the project. And it won’t be your typical amusement park with roller coasters, explained Richard Burch of Oz Central. “Oz will be a world-class theme park with thrilling experiences, interactive rides and amazing, immersive environments unlike anything anyone has seen,” he said. Demler sees both processes going smoothly. The town will assume lead agency status on the environmental review at its August meeting and he said it should be done by November. As for the state funds, Demler said the state is “ready and willing to work,” and has been putting an incentive package together. Theme park master planners Thinkwell Design & Production of Burbank, Calif., in association with Kirk Design Inc. of Long Beach, Calif., have completed a preliminary design package for the state-of-the-art theme park and resort. The vision for the park is based on the vast collection of Oz books — 38 — written by Baum. It’s taken more than two years for Oz Central to choose a site for the theme park — in recent months it had come down to Wheatfield and Houston. What swung it in Wheatfield’s favor, according to a release from Oz Central, were the favorable results from feasibility studies by Economic Research Associates. In addition, Urban International of Los Angeles, a group made up of former Disney executives, played a key role in land planning and financial analysis to support the success of the proposed theme park. And it probably helped that a world-class tourist attraction is a few miles to the west. Not to mention to those in such nearby cities as Toronto and Cleveland. So far, Demler likes what he sees from Oz Central, particularly after meeting some impressive investors with the company during a recent trip with his wife and town Attorney Robert O’Toole to California — details of which will be revealed in the coming months. “It’s kind of a big deal,” he said. For instance, Demler said Urban International has projected 10,000 construction jobs, 8,000 jobs when the park opens and 15,000 jobs in the entire region with $25 million in annual tax revenue going to Wheatfield, $10 million to the county and $35 million to the state. For Oz Central’s part, Wheatfield seemed like the right choice.